It was in 2006, on the remote surf mecca of the South Lombok coast, Ashtari’s first Shala was born; a humble meditation hut, tucked amidst lush greenery on top of a hill with breathtaking ocean views over the South coast towards Sumbawa. As more brave travellers and surfers uncovered this wild remote coastline, Ashtari Yoga was called upon for more practice. With fresh air that heightens your breath awareness and a view that nourishes your senses, this is a place that allows you to realign your yoga practice with nature’s unspoiled beauty. A whole day spent in positivity, within this beautiful sanctuary can fully immerse you in the present moment connecting mind, body and spirit. Our passionate teachers comprised of Indonesians and foreigners, weave classes that strikes perfect balance between knowledge and compassion. They look forward to sharing yoga in a way that empowers you and your love for the practice. You may never want to leave again after falling in love with the area, world renowned for its surfing. The epic coastline of multitude bays surrounded by rocky headlands proves this is truly a magical place that breathes unique lifestyles and inspires many travellers and visitors. A combination of invigorating and relaxing classes is offered 8 times a day in 2 amazing locations. It is definitely a place every wandering soul should experience. Nature lover always seeking for spiritual wisdom, Marilu found her purpose in life when she started practicing yoga 16 years ago. She started teaching in 2004 in gyms and well-known studios in Lima training professional surfers and people with sport injuries. Parallel to her regular classes, Marilu was responsible for the prenatal program in Prenatal Center Peru. While she initially studied the Iyengar method, she eventually developed love for Ashtanga Yoga. Marilu committed her way of life to the Ashtanga practice, traveling frequently to Mysore India to study with her Guru Sharath Jois. After many years of self discipline and patience, she was granted “authorized teacher” by the KPJAYI. Feel the knowledge of movement, alignment and all the wisdom that she has gained through years of practicing the correct Ashtanga method in the lineage of Guruji. This amazing teacher will guide you with great care and make you love this beautiful practice even more. Almitra’s teaching abilities comes naturally as she used to be a school teacher. Growing up she has always felt the need to explore the outdoors and find a deep connection with nature through hiking across the mountain ranges of Java. In high school, hockey was her main sport and this went hand in hand with her many adventures. Then yoga found her. 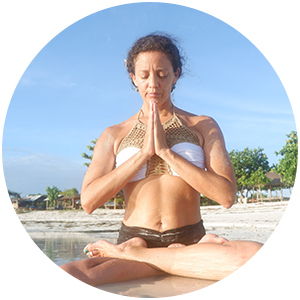 After training and teaching around her home town, she moved to Lombok and joined Ashtari Yoga team on the paradise island of Lombok. 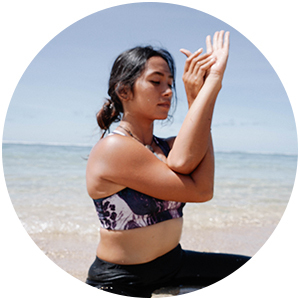 Her Vinyasa classes (first trained with Power Of Now Oasis), highly inspired by the peacefulness of nature, carry students through smooth breathing techniques that perfectly syncs with movement. Everyone is guided to move in a very slowness and aware manner, with the balance of challenge and comfort as goals for practice. Over the years at Ashtari Yoga, her knowledge and experience has deepened thanks to over one thousand of teaching hours, many workshops, the mastering of Yin Yoga techniques, the completion of an Acroyoga Teacher Training (by Hanuman Acrobatic Yoga) and to top it off a successful 500 hour TT in Cambodia (by Neo Yoga India). Learn how to tap into channeling your energy using Singing Bowls as well as how to use them in your yoga/healing/massage class or private sessions. The first one in Lombok! We will explore the Panchamahabhutas, the elements that are in Nature. According to Ayurveda our body is composed of this 5 elements. Fire (Agni), Earth (Prithvi), Space ( Akash), Air ( Vayu), Water (Jal). Constantly changing and interacting with each other , they creat a situation of dynamic flux that keeps the world going. Ecstatic dance has been practiced throughout human history, including in classical times by the Maenads, followers of the wine-god Dionysus. In the ancient and widespread practice of shamanism, ecstatic dance and rhythmic drumming are used to alter consciousness in spiritual practices . The effects of ecstatic dance begin with ecstasy itself, which may be experienced in differing degrees. Dancers are described as feeling connected to others, and to their own emotions. The dance serves as a form of meditation, helping people to cope with stress and to attain serenity. Ashtanga Yoga Teacher. Had explored many types of yoga, basically Iyengar and Ashtanga. Also studied and performed Modern Dance, exploring many types of corporal expression and rediscovering Ecstatic Dance. Her traditional roots from Peru made her since young to be involve in Afroperuvian music. This special class will focus on learning and applying Restorative yoga poses for surfing. The Pachamama ceremony, or âOffering to the Earth,â is a sacred ritual in which an offering (called a despacho) is made to Pachamama, Goddess of the Earth or Mother Earth as participants make a prayer or request for whatever they wish. People in some South American countries have been performing this ceremony since the time of the Incas and it is still important to people today. Peruvians typically do a Pachamama ceremony at least once per year. This practice is especially popular among businesses to ask for prosperity for the coming year. The ceremony is also done for homes to ask for protection, good luck, health or in order to get rid of bad energies. Is a form of dance in which the dancers, sometimes without the need to follow specific steps, abandon themselves to the rhythm and move freely as the music takes them, leading to trance and a feeling of ecstasy. By Almitra Putri 500hr. Certified teacher. Whether you are sick or weak, young, old or even very old, you can succeed in yoga if you practice diligently. – Svatmarama (Hatha Yoga Pradipika). If you are new to yoga, welcome. Yoga can change your life. If you are currently practicing yoga but want to learn more, you probably already know something of yoga’s life-changing potential. If you are sick, it can help you feel better. If you are depressed or anxious, tired all the time, addicted to drugs / alcohol / smoke, or bothered by low back pain, yoga can set you on the correct path. The workshop will answer (what, why, when, where, who, how, how) yoga fits in preventing and healing these problems. We will cover theory, and give simple asana, pranayama, and dietary that you can practice in daily activity. This course is only for education. It will help to develop your awareness in your intention, thought, exercise, breathing, diet. It’s not for individual therapy. For therapy, the practice need to be tailored to individual needs. After this course we hope that you will understand that yoga is beneficial for you. You will be able to choose your preferable yoga teacher, and you know what you need to focus on to fulfil your needs. With this understanding it will make you easier to know your feeling and communicate your condition with your family, doctor, therapist, yoga teacher.